Also available on XBLA and PSN. My first concern with Blade Kitten was the notion that two vastly different words could be juxtaposed in such a disconcerting way. A blade is a weapon of slashing and maiming, whereas I have it on good authority that a kitten is a device used only to a fluffy and endearing end. In what twisted world could the two drastically dissimilar nouns coexist in a single, shameless title? Surely not a world I would want to live in, and yet there I was. Linguistic emotional rollercoaster aside and images of murderous felines suppressed deep into my subconscious, my second concern was that I hadn’t even heard of the comic series on which the game was based. Not a good start at all, I’m sure you’ll agree, but this didn’t seem to matter once I got down to actually playing the thing. So, how was it? The overall aesthetic of the game is very stylised, in an obvious nod toward the comic. Bright colours wash over everything in abundance, and the menu features some incredibly quirky quasi-oriental music. I found it difficult not to draw comparisons to titles such as Borderlands in the aesthetics department, and I hope the image that conjures in your mind goes some way to describing the reasonably attractive setting of the game. 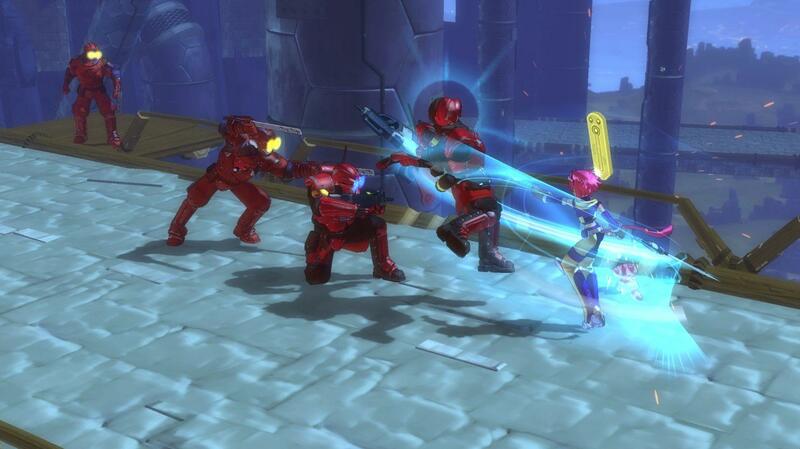 This extends somewhat to the character design too, as I’m reasonably sure I was fighting the Crimson Lance. Decent use of physics is made, if only to decorate levels. Pots and crates are sent flying every which way as you dash around the different platforms collecting what are essentially coins and hitting checkpoints. Unfortunately, I found the controls to be sluggish in the instances where this mattered most such as when trying to change direction quickly, as well as stopping yourself from being crushed by machinery due to a bizarrely over-done skidding animation played after sprinting. The controls themselves are a fairly standard platforming affair; directional arrows to move, space to jump and double jump, E to interact and with the mouse buttons serving as your means of waving the Blade about. I say you wave it, but the Blade itself seems somewhat intelligent and doesn’t even require Kit (the protagonist) to be holding it in order to function. I daresay the Blade would perform most admirably even without it’s feline companion, possibly even better without having to wait for her to climb up every wall and retreat for running jumps. It’s no coincidence that Blade comes first in the title. He’s definitely my favourite character. The combat is reasonable, if not fiendishly easy. Spamming left-click will most certainly see you through the majority of encounters, but I wasn’t averse to throwing in a few double jumps for good measure. The platforming aspect of the game, from what I played, was relatively simple too. This is no detriment, however, as over-complication does not a good platformer make. Sadly, though, this simplicity is often Blade Kitten’s Achilles heel. For example, if you want to make Kit climb a wall you need only have her walk toward it, but inadvertent contact with a wall in the heat of combat can result in her dutifully grabbing onto them, interrupting any impressively acrobatic feat of arse-kickery and stopping you dead in your tracks. The ‘blade play’ itself is acceptably satisfying, as enemies are sent reeling away from your devastating swipes. It really is ‘press left mouse to win’, but this formula is somewhat shaken up by enemies who tend to block more, attack from a distance, and so on. Much in the way that Diablo isn’t particularly difficult at the beginning, you will still enjoy thrashing around eliminating everyone in your path. Should you get into a sticky situation, you need only clamber away to a platform inaccessible to your comparably dense attackers, because health regenerates after a few moments. There are a few interesting ‘driving’ segments where you ride on the back of what can only be described as a large, pink, bipedal dinosaur type creature. These parts are generally fun, and as I dodged obstacles and jumped over explosive mushrooms (or were they mines?) I was vaguely reminded of one of the many Crash Bandicoot chasing levels. Good stuff. As for the narrative, I don’t want to spoil anything for you, though I’m not entirely sure there’s much to be spoiled. Suffice it to say you dock your ship on a strange planet in order to accept a bounty offer which is then, among other things, stolen from you by a peculiar and frankly insulting blonde woman dressed in red. Obviously that just wont do, so Kit sets off in hot pursuit of the burgundy culprit. It was here, about fifty seconds into the game, that I realised the voice acting wasn’t particularly stellar. Not to worry, though, I’ve heard far worse and it’s still refreshing to hear the soft, quirky remarks made by this girl-cat-person who sadly exists amidst the oh-so-many corny, animalist grunts of Angry Space Marine type protagonists in other games. Technically speaking, there aren’t many options to tone the game down graphically if you’re struggling to run it (which you probably shouldn’t be, the specifications are listed here) aside from a comprehensive list of screen resolutions, and the ability to toggle shadow rendering. Sadly, there’s no save feature, so you’ll have to rely on the autosaved checkpoints which can be a bit of a nuisance, though they’re placed regularly enough. There is, however, excellent Steam integration, offering Cloud support and a decent amount of achievements should that kind of thing be worthwhile to you. 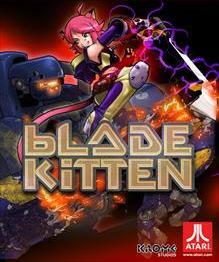 If you’re looking for a combat-oriented platformer with a quirky vibe and don’t mind looking past a few minor annoyances with regards to the controls and difficulty you can’t go too far wrong with Blade Kitten, though the narrative might be lost on all but fans of the web comic. No mention that the levels are ENORMOUS, each holding 20-30 secret areas? About half of each level is entirely optional, and collecting everything that is to be collected can take ages, and quite a lot of platforming skill, too. On the first level alone, there’s a huge section that only secret-hunters can see, a massive aerial segment filled with floating containers to clamber over and barges to ride around. I didn’t see it at all until my second playthrough. As for the controls, they behave a lot better if you just plug in a gamepad. The mouse controls are better than most, but platformers (especially ones as reliant on analogue precision) tend not to do too well with a keyboard for this reason.